Come enjoy some sparkling colors and passionate aura's with a Spanish Style Masquerade Ball!!! Come enjoy some sparkling colors and passionate aura&apos;s with a Spanish Style Masquerade Ball!!! Hello everyone! Lisa back with more exciting Tampa Bay Events, sponsored by our amazing partners! This unique twist on a fun night, is sure to ruffle your feathers with excitement. 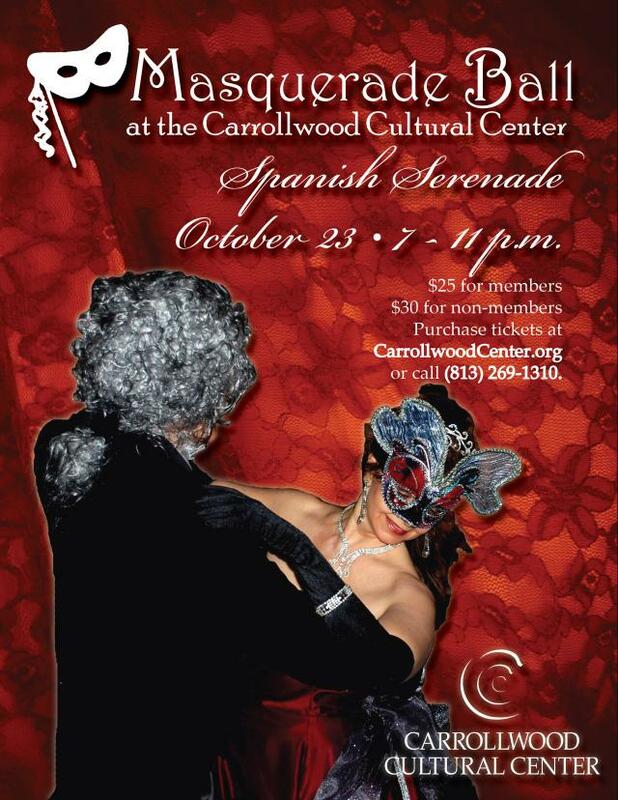 The non-for profit Carrollwood Cultural Center is hosting it&apos;s second annual fund-raising event, Masquerade Ball, on Saturday, October 23 from 7pm-11pm. For those of you who aren&apos;t quite sure what a masquerade ball entails, I will give you a very simple definition. A masquerade ball is a party where the guests attend in costume, and wear masks. Sounds simple enough, and really fun! The guests of this particular masquerade ball are encouraged to come in costume, but it is not required. To help with your costumes, they will be selling masks and Spanish style fans at the event. So lets talk about the unique twist for this masquerade. The Carrollwood Cultural Center has come up with a theme this year, to help pay tribute to Spain&apos;s reputation for luring artists and musicians. Since the Cultural Center is focused on offering cultural programs, services and events, it&apos;s only natural that they would pick a unique theme. It&apos;s official theme is "Spanish Serenade." Fitting in with their theme, the Carrollwood Cultural Center is going to have some fun Tampa Bay Entertainment, with the band SOL CARIBE. Sounds like a lot of Spanish dancing will be going on! Also, they are going to be serving hors d&apos;oeuvres! Yum! Ok time to talk ticket cost. For Carrollwood Cultural Center members, it is only $25 to enjoy this event, and for non-members, it&apos;s only $5 more! Now that&apos;s a deal! Plus all of the proceeds will benefit the Carrollwood Cultural Center. The event will take place at the Center, located in Tampa. It opened in 2008 and provides more than 22,000 square feet of space for the arts. Their mission is to offer cultural programs, services and events that encourage individual exploration and promotes a sense of community. For more information about what they do just click here. I&apos;m sure this is going to be a great event, and what an awesome cause. Signing off for now, but stick around because I&apos;m sure there will be plenty more Tampa Bay Area Events in the near future!